Following the wide spread mockery which followed her appearance at the 2018 AMVCA,former Big Brother Naija housemate, BamBam has hit back at critics of her flurry dress. Posting more stunning photos, she wrote; ‘Fashion is art’. Recall that BamBam’s outfit to the event, caused a stir online as everyone had an opinion about it and got Nigerians divided on lines of support and trolling. 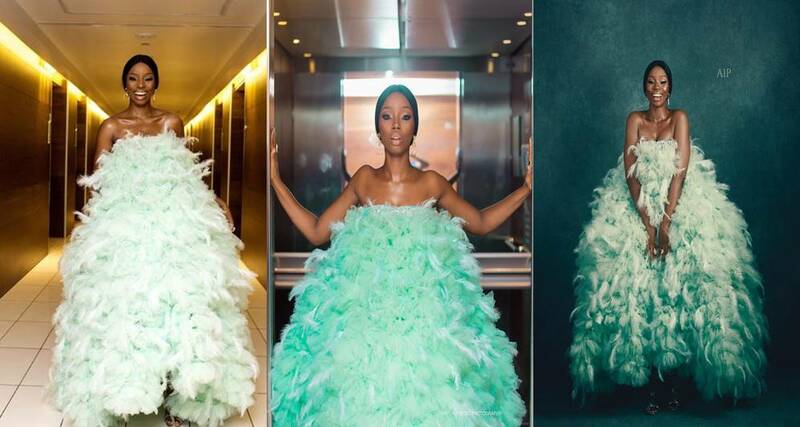 The actress wore a flamboyant green-feathered dress which was designed by Houseofjahdara, to the Africa Magic Viewers’ Choice Awards (AMVCAs) which held at Eko Hotels and Suites on Saturday. The 29-year old, whose outfit did more of the ‘trend’ job, wore minimal makeup, a few accessories, and finished with strappy gold sandals. Her hair was done in a ponytail which allowed her gold earrings take center stage. While BamBam’s outfit to the event had a unique, it should be noted that same Houseofjahdara also designed the dresses worn by ex-beauty queen, Munachi Abi; singer, Waje; and actress, Eniola Badmus. @josh__ik, “Fine chick, fine chick. Bambam has turned to mother hen’’[email protected], “I knew Bambam would stand out. Her fashion sense is out of this world’’.